Audinate will also introduce its new two level Dante certification program at the event. Dante AV Networking World will give design consultants, system integrators, audio engineers and IT managers the tools and information they need to get the most out of Audinate's revolutionary audio networking solution. As part of the workshop, Mackie will be showing the new AXIS Digital Mixing System, offering a Dante capable mixing solution for professional production and system integration applications. 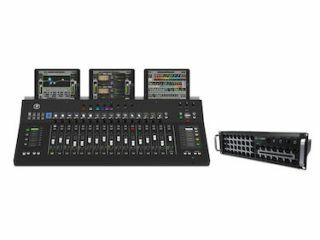 The modular 32-channel system aims to drastically speed up workflow through visual feedback and customization. Multiple guided seminars are also available daily throughout the show at the Mackie booth (#C9745). Audio Networking Trends and Research, presented by Roland Hemming, RH Consulting. Following the joint general session, attendees will have the option of attending one of two tracks. Track 1 is designed for attendees that are new to Dante, and are looking for the basic foundation to get started. Introduction to Dante, covering audio networking fundamentals, basic networking concepts, creating a small-scale Dante network, and using Dante Controller and Dante Virtual Soundcard. Intermediate Dante Concepts, covering topics such as Dante redundancy, clocking, latency, multicast and AES67. Advanced Dante Workshop, an interactive session covering advanced networking concepts, mixed use networks, networking best practices, and troubleshooting techniques. All attendees will receive 4 InfoComm CTS RU credits. In addition, attendees will have the opportunity to participate in Audinate's new Dante Certification Program. The Dante Certification program will provide a way for design consultants, integrators and others to promote their proficiency to build, operate and support Dante networks of various sizes. Co-sponsoring the Dante AV Networking World event are 40 distinguished audio brands, each showcasing Dante-enabled products in a hands-on demonstration room. These companies include: AKG, Allen & Heath, AMK Innovations, Amphenol, Ashly Audio, Attero Tech, Audinate, Audio-Technica, AuviTran, Bosch, Bose Professional Systems, BSS, ClearOne, Crest Audio, dbx, Electro-Voice, Extron, Focusrite RedNet, Harman, Lectrosonics, Mackie, Media Vision, Nexo, Peavey Commercial Audio, Powersoft, RDL, RTS Intercom Systems, Rane, Renkus-Heinz, Sennheiser, Shure, Soundcraft, SoundTube Entertainment, Stewart Audio, Studer, Symetrix, TASCAM, Visionary Solutions, VUE Audiotechnik and Yamaha Commercial Audio. Media sponsors for the event include ProSoundWeb, Live Sound International rAVe Publications and Sound & Communications. The program runs from 9:00 am to 4:30 pm and includes a catered lunch for all attendees and a hosted cocktail reception to conclude the day.